ANNOUNCEMENT: Tech N9ne To Perform On Jimmy Kimmel Live – Get Your Tickets Now! Tech N9ne is about to hit the airwaves in a big way! 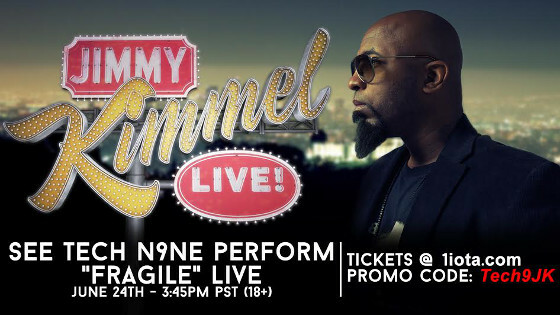 Make sure to tune in to ABC on June 24, 2014 at 11:35 PM EST/10:35 PM CST to watch Tech N9ne perform “Fragile” on Jimmy Kimmel Live! Tech will be joined by Krizz Kaliko, ¡MAYDAY! and Kendall Morgan to perform the smash hit that’s taken over the airwaves in 2014. FANS: You can be there to watch it all go down! The taped performance will be at 3:45 PM PST on June 24! You can get free tickets in the link below if you use the promo code Tech9JK.